In recent times we have received queries from prospective Glitzkoin investors. They often request for a clarification regarding the Glitzkoin token symbol, the confusion is between GLT and GTN. There has been a significant increase in these queries ever since, we announced the surge in the price of the Glitzkoin token. Official media reports from Glitzkoin, have highlighted the 50% increase in token prices – this in a rather gloomy and bearish market. The Glitzkoin token trades under the Crypto Ticker Symbol GTN and not GLT. So how is the crypto launched as part of the diamond blockchain project, being confused with the GLT symbol. It is a known fact that there is no globally recognized office (as yet) that, assigns and validates the availability of Crypto Ticker Symbols. The Glitzkoin ICO which ran from March 2018 to June 2018, had used the GLT symbol for its token. It was a short while later that, we were informed about another crypto by the same name - GLT. Seeing the confusion that would be triggered in the future, Glitzkoin changed its Crypto Ticker Symbol to GTN. 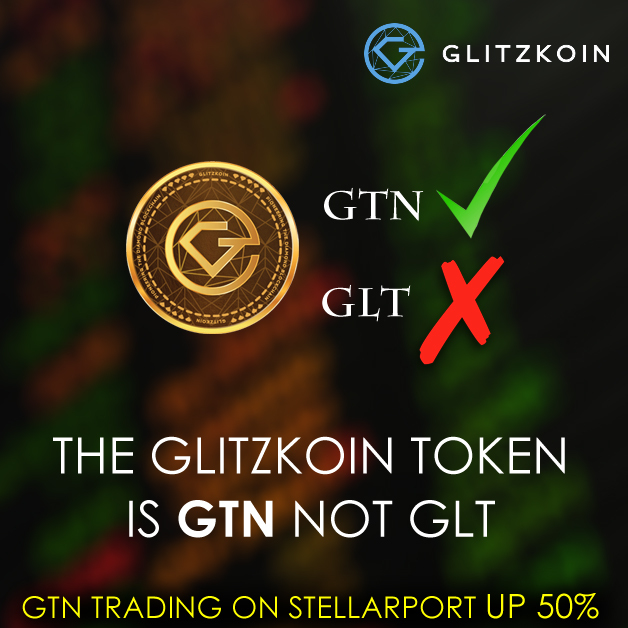 The Glitzkoin GTN token was listed on the Stellarport exchange in July 2018 – this as GTN and not GLT. While further exchange listings are expected through 2019, the token will continue to use the GTN ticker symbol. The crypto world is expanding at an alarming rate, it is therefore not surprising that the GTN and GLT issue has drawn renewed interest. We also have queries from investors seeking information regarding, the duration of the Glitzkoin ICO. As explained above, the ICO was completed successfully in June 2018. At the time of releasing this report (January 2019), the GTN is trading on Stellarport at around $0.30 – a 50% rise based on the $0.20 ICO closing price of the token. It is a coincidence that the GLT token is currently trading at around $0.003 – this has sparked the much talked about confusion. You can track and trade the Glitzkoin GTN token on the exchange GTN ON STELLARPORT. For those of you who happen to be interested in investing in the Glitzkoin GTN token, we would suggest that you read the project summary and updates below – before making a decision. We have always strived to build a crypto that is stable and consistent, we do not wish to encourage reckless speculation. Promoted by second generation diamond veteran Navneet Goenka, the Glitzkoin diamond blockchain project is poised to improve productivity and market scope for the multibillion dollar diamond industry. The GTN token launched as part of the project is currently trading on the Stellarport exchange ($0.30) at, 50% above its ICO closing value ($0.20). Glitzkoin includes a comprehensive diamond trading platform – DiaEx. Designed to support B2B and B2C trade in the glittering stone, DiaEx uses the GTN token to settle payments. Efforts are on to increase applications for the Glitzkoin GTN token. As announced in January 2019, Glitzkoin is now an official payment partner, on the ticketing portal Myticket.asia. To be implemented in the first quarter of 2019, the arrangement allows Myticket.asia customers to pay for their purchases using the GTN token.